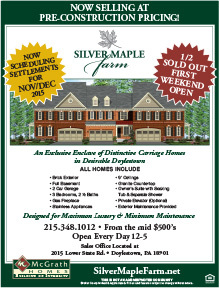 New Homes in Newtown, Bucks County. Affordable Luxury! McGrath Homes’ newest residential community, Phillips Court, offers its discerning residents the opportunity to share in the heritage of Historic Newtown Borough, while enjoying the very finest in modern amenities. Phillips Court is a community of stately brick carriage homes of timeless design and quality, featuring the latest in contemporary comforts and amenities. Each home is built with the very finest in materials and craftsmanship. One visit and you will know this is the ideal location for writing your own personal history. Luxury is the standard at Phillips Court, and each home features a magnificent kitchen with stainless steel appliances, classic 9’ ceilings, elegant hardwood flooring, a lavish owner’s suite and bath, energy efficient construction and design, and much more. Phillips Court was designed for maximum luxury and minimum maintenance, and the community provides professional landscaping, lawn care, exterior painting, and snow removal services to all residents.